The fire brigade teams have rushed to the spot. A chartered plane has crashed in an open area near Jagruti building in Ghatkopar in Mumbai, reported ANI. According to details available, the plane has crashed in Sarvodaya nagar in Ghatkopar west. 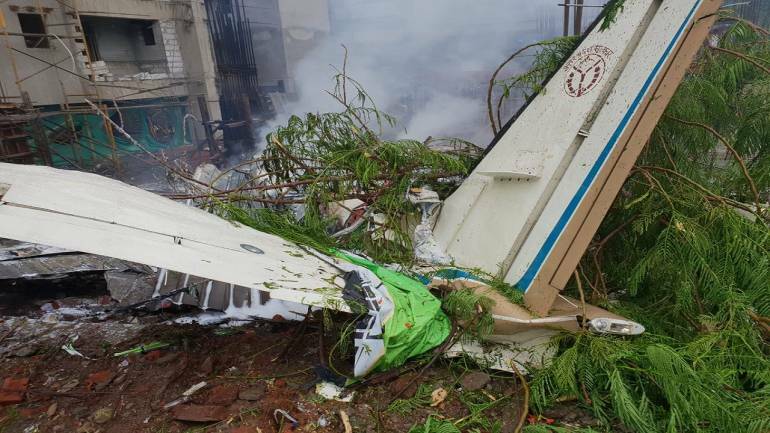 Two pilots, two Aircraft Maintenance Engineers on board and one person on ground are dead in the Mumbai chartered plane crash, Directorate General of Civil Aviation said. The plane that crashed was owned by the Pan Parag group. The plane was supposed to land in Juhu, according to media reports. Fire brigade teams have been rushed to the spot. Mumbai Police have said that further investigation is under way. "The chartered plane which has crashed (in Mumbai's Ghatkopar) does not belong to the Uttar Pradesh government. The state government had sold it to Mumbai's UY Aviation. The deal was done after the plane had met with an accident in Allahabad," Principal Secretary Information Avnish Awasthi said.